Sony Michel scored from two yards out in the fourth quarter. It wasn’t the offensive shootout that many were expecting, but the Patriots still managed to capture their sixth Super Bowl title with a 13-3 win over the Los Angeles Rams. “It was an unbelievable year. 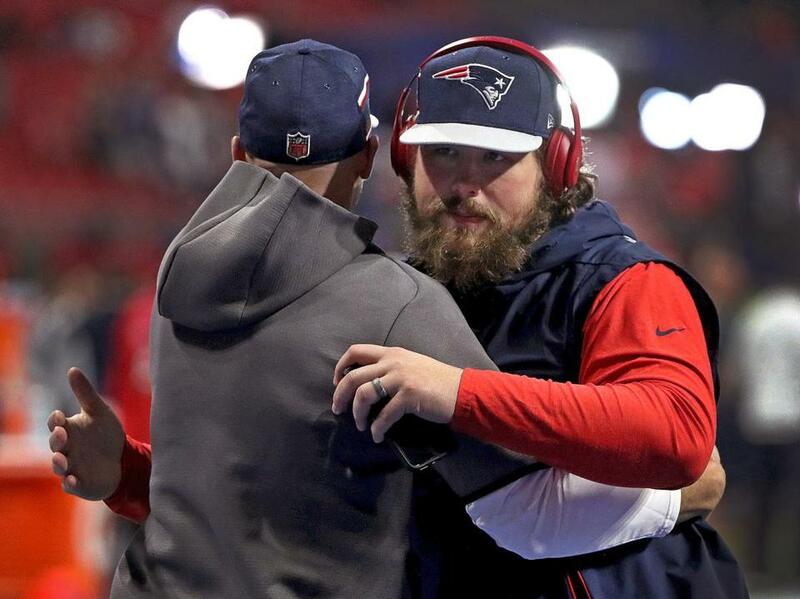 We fought through everything,” Tom Brady said as he was swarmed after the game. Brady also said the victory did not change his outlook regarding his football future. He has indicated a desire to play until he is 45, and has now won six Super Bowls at age 41. The Patriots took the lead in the fourth quarter when Sony Michel scored from two yards for a 10-3 lead. Michel finished with 94 yards on 18 carries. Stephen Gostkowski added his second field goal with 1:12 remaining to account for the 13-3 final, the lowest scoring game in Super Bowl history. Entering Super Bowl LIII, the lowest-scoring title game in NFL history was Super Bowl VII in 1973. The Miami Dolphins defeated the Washington Redskins by a score of just 14–7. Brady completed 21 of 35 passes for 262 yards. Julian Edelman had 10 receptions and 147 yards and was named the MVP. He is just the seventh wide receiver to win the award, and the first in 10 years – Santonio Holmes of the Pittsburgh Steelers won in 2009. The Patriots took control with 9:49 remaining, marching 69 yards on five plays for the only touchdown of the game. Rob Gronkowski had two receptions for 47 yards on the drive, including a 29-yarder down the left sideline to give the Patriots first and goal at the two to set up Michel’s touchdown. Gronkowski finished with six receptions for 87 yards. The Patriots defense stifled the Rams, sacking quarterback Jared Goff four times and forcing him to throw a crucial interception late in the game. Cornerback Stephon Gilmore leaped to make a grab to preserve the 10-3 lead for the Patriots with 4:17 remaining. Dont’a Hightower recorded two sacks. The 10-point win was the largest margin of victory for any of the Patriots’ six Super Bowl wins. It was a quiet first half. The Patriots marched into Rams territory on the game’s opening drive, running the ball on the first four plays, but Brady was intercepted on his first pass of the game at the Rams’s 27 yard line. After forcing the Rams to go three and out, they once again moved into Rams territory, but the drive stalled, and Gostkowski missed a 46-yard field goal attempt. 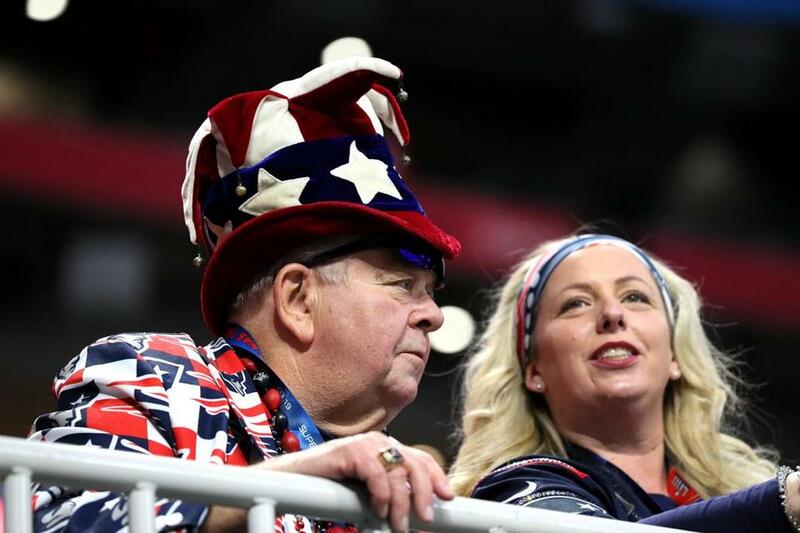 The Patriots scored the only points of the first half when Gostkowski connected on a 42-yard field goal to take a 3-0 lead at halftime. Greg Zeurlein booted a 53-yarder in the third quarter as the Rams pulled even, 3-3. A duck boat victory parade is scheduled for Tuesday morning in Boston, according to a tweet from Mayor Martin J. Walsh. Below are updates as the game happened. Here is the box score. Patriots 13, Rams 3 (0:00): Greg Zuerlein’s 48-yard field goal attempt sailed wide left. Jared Goff connected with Robert Woods for 10 yards, then found Brandin Cooks for 24 yards and 21 yards to set up the field goal try. Tom Brady took a knee to clinch his sixth Super Bowl. 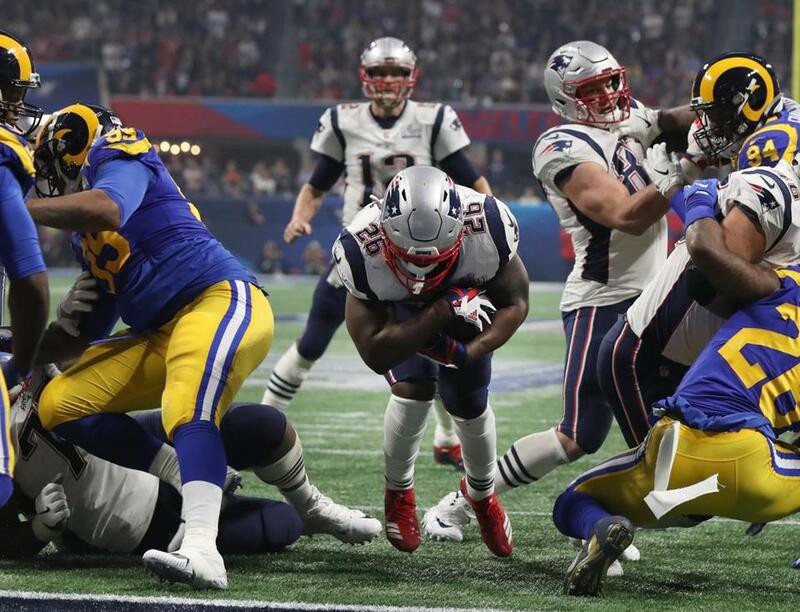 Patriots 13, Rams 3 (1:12): The Rams stopped Sony Michel inches short of the first down marker on 3rd and 1 at the Los Angeles 24-yard line. After calling timeout to discuss their options, Bill Belichick sent Stephen Gostkowski to kick a 41-yard field goal. Gostkowski kept the kick inside the left upright to give New England a 10 point lead. On the second play of the drive, Sony Michel took a handoff from his own 5-yard line 26 yards through the heart of the Los Angeles defense. The Patriots picked up another first down on the next play when Rams linebacker Dante Fowler was flagged for illegal hands to the face. Rex Burkhead, running in James Develin’s wake, picked up 26 yards and a first down to force Rams head coach Sean McVay to use his third timeout. Michel rushed for nine combined yards on back-to-back carries before he was stuffed on third down. Patriots 10, Rams 3 (2:00): The Patriots stand on the Los Angeles 24-yard line at the two-minute warning. Patriots now at 115 yards rushing. They?re 11-0 when running for 100+. Patriots 10, Rams 3 (4:17): Stephon Gilmore leaped to pick off an under-pressure Jared Goff at the New England 4-yard line. On the first play of the drive, Goff hit Brandin Cooks for 19 yards and a first down. Goff ended up on the turf on the following play as Kyle Van Noy slammed him down after he threw an incompletion. The quarterback picked himself up and found Robert Woods, who picked up 17 yards. Brandin Cooks, with Stephon Gilmore in tight coverage, dropped a potential touchdown on the next snap. Then Gilmore intervened once again, reeling in a deep ball intended for Cooks. Patriots 10, Rams 3 (7:00): Rookie running back Sony Michel burst through the Rams’ defensive line for a 2-yard touchdown. Tom Brady marched the Patriots downfield with four straight completions. First, he found Rob Gronkowski for 18 yards, then he connected with Julian Edelman over the middle for 13 more. Brady targeted Rex Burkhead for seven yards, before lofting a pass to Rob Gronkowski. The tight end laid out for a diving catch at the Los Angeles 2-yard line for a 29-yard gain that set up Michel’s score. 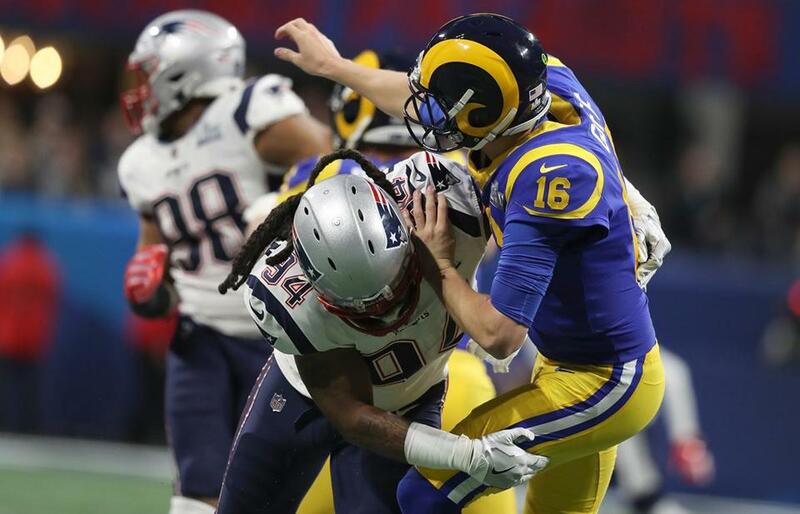 Patriots 3, Rams 3 (9:49): Patriots defensive end Trey Flowers stuffed Todd Gurley for a 1-yard loss on 3rd and 22, forcing John Hekker to punt to the New England 31-yard line. 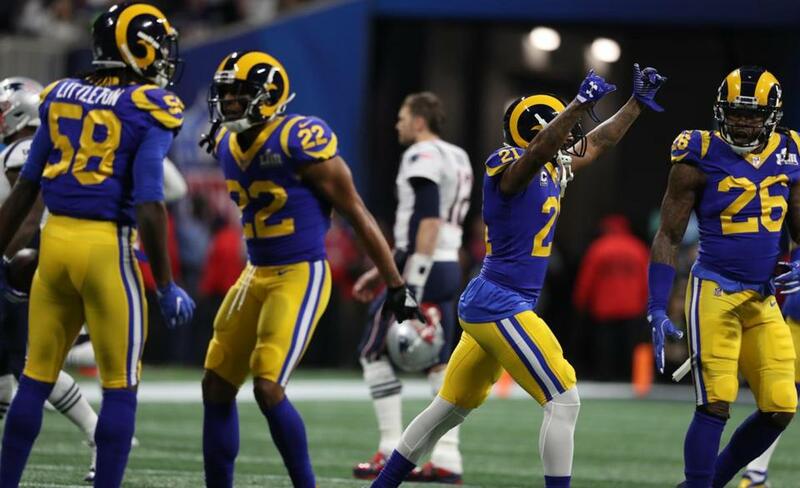 Early in the drive, Patriots cornerback Stephon Gilmore punched the ball out of C.J Anderson’s hands but it rolled out of bounds and the Rams kept possession. The Rams converted a 3rd and 2 with an 8-yard completion to Brandin Cooks, then kept the drive alive once more when Gilmore was whistled for defensive holding on 3rd and 11. Goff found Brandin Cooks for 16 yards on the following play, before a holding penalty on Rams center John Sullivan wiped out a 13-yard rush by Todd Gurley. Goff aired it out on 2nd and 22 down the left sideline but failed to connect with Cooks. 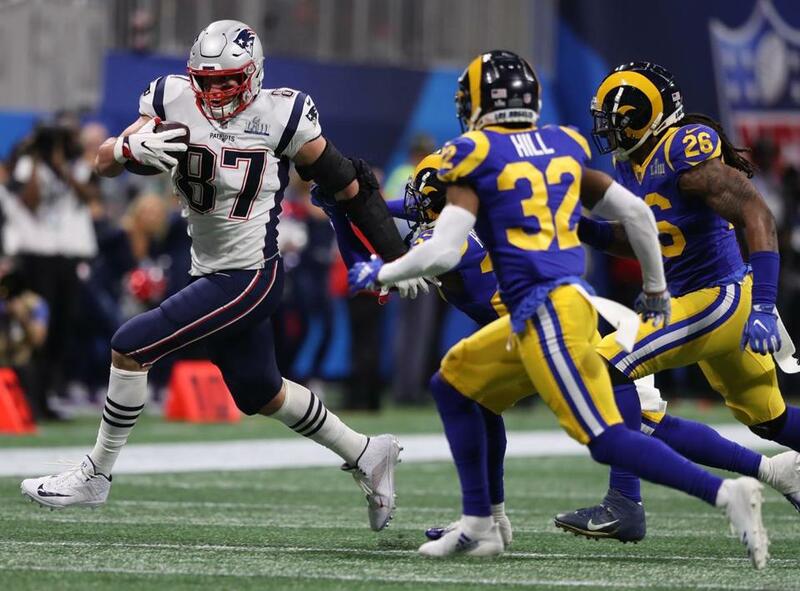 Patriots 3, Rams 3 (14:47): Tom Brady and James White couldn’t connect on 3rd and 5 as the Patriots’ drive ground to a halt. Punter Ryan Allen pinned the Rams on their own 7-yard line. On the third play of the drive, Sony Michel bounced off a would-be tackler and raced for 19 yards. Michel then ran for a combined six yards on back-to-back runs to bring up the incompletion. Second time in Super Bowl history the game has been tied after 3 quarters, joining the Patriots-Eagles in Super Bowl 39. Patriots 3, Rams 3 (0:00): The Patriots stand on the Los Angeles 44-yard line at the end of the third quarter. Sony Michel bounced off a would-be tackler and raced for 19 yards. Patriots 3, Rams 3 (2:11): Greg Zuerlein kicked a 53-yard field goal to put the Rams on the board. On the third play of the drive, Jared Goff found Brandin Cooks for 16 yards. Three plays later, Goff stayed composed in a collapsing pocket and fired over the middle to Robert Woods for 18 yards on 3rd and 6. It took nine tries, but the Rams finally convert a third down. Cooks looked to be wide-open in the end zone on the next play, but Patriots cornerback Jason McCourty sprinted back to knock the ball out of his hands and prevent the touchdown. Jason McCourty denies America a touchdown. After a 3-yard completion on the following snap, Dont’a Hightower eluded his blocker and sacked Goff for a 9-yard loss on third down to stall the drive. Hightower is the 6th Patriots player with multiple sacks in the Super Bowl. Trey Flowers had 2.5 last year, and Bruschi, Vrabel, Adalius Thomas, and Dennis Owens had two each. Patriots 3, Rams 0 (6:29): Although Tom Brady looked for Chris Hogan deep downfield on 3rd and 5, the pair did not connect and the Patriots’ drive stalled after three plays. New England thought they had a first down when James White picked up nine yards on 2nd and 8, but the play was called back for an illegal shift. Brady found Julian Edelman for an 8-yard completion on the next play before the incompletion. The Patriots are now 3-10 on third down. That was the sixth target to Chris Hogan. None of them have been complete. How about we try Phillip Dorsett on a double-move? He ran a shallow drag route on that last third down. Patriots 3, Rams 0 (8:36): A split second after Jared Goff threw the ball away for an incompletion on 3rd and 6, Dont’a Hightower threw him to the turf. John Hekker’s 65-yard boot from his own 6-yard line set the record for the longest ever punt in the Super Bowl. Todd Gurley ran for a combined four yards on back-to-back carries before the incompletion. Patriots safety Patrick Chung has been ruled out for the rest of the game. 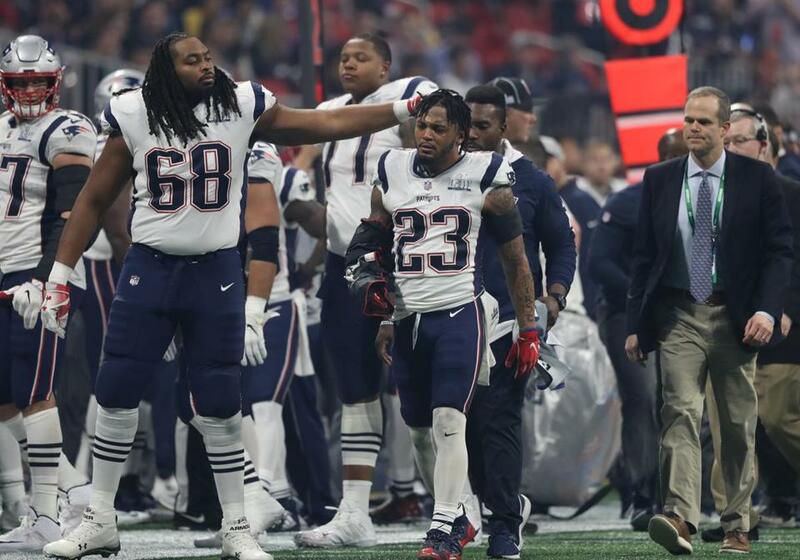 Patrick Chung walked off the field and into the locker room with his arm in an air cast in the third quarter. 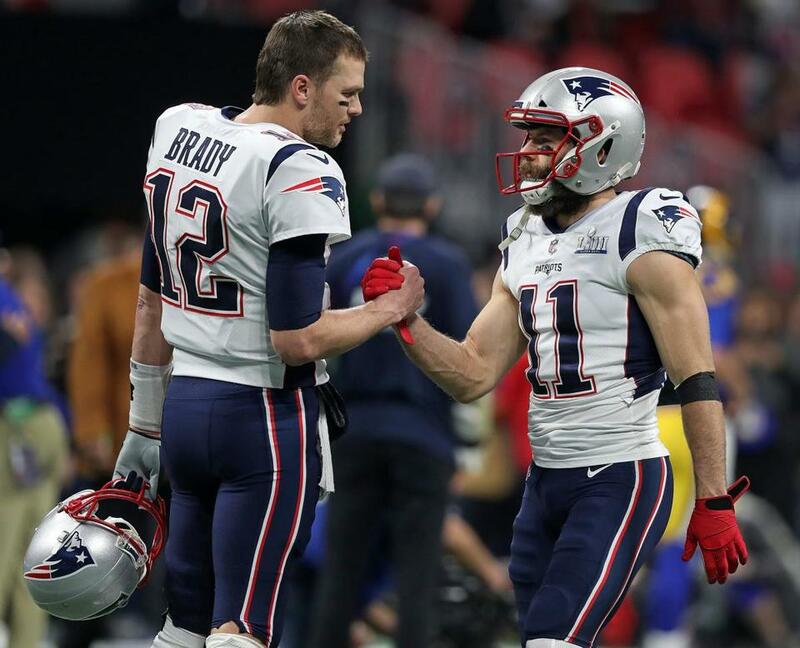 Patriots 3, Rams 0 (10:06): On 3rd and 2 from the New England 49-yard line, Tom Brady and Julian Edelman failed to connect on a short pass. Matthew Slater downed Ryan Allen’s punt at the Los Angeles 2-yard line. On 3rd and 4 early in the drive, Tom Brady hit Julian Edelman in stride over the middle. The slot specialist sidestepped a defender and raced for 27 yards. Edelman then picked up eight yards on 2nd and 10 before the third down incompletion. Patriots 3, Rams 0 (12:58): Patriots cornerback Stephon Gilmore broke up Jared Goff’s 3rd and 5 pass intended for Brandin Cooks to stall the Rams’ drive. Julian Edelman waived for a fair catch at the New England 8-yard line. On the first play of the Los Angeles drive, Patriots linebacker Dont’a Hightower nearly had an interception but the potential pick slipped through his hands. Rams running back Todd Gurley ran for 16 yards and a first down on the next snap. Patriots safety Patrick Chung was injured on the tackle. Patriots 3, Rams 0 (14:07): On the first play of the Los Angeles drive, Patriots linebacker Dont’a Hightower nearly had an interception but the potential pick slipped through his hands. Jared Goff was sacked by Kyle Van Noy in the second quarter. The Patriots and Rams were held to a combined three points. It marked the lowest point total in the first half of a Super Bowl since 1975, when the Steelers led the Vikings 2-0 at the break In Super Bowl IX. In 18 games this year prior to the Super Bowl, the Rams had been held to fewer than 7 points in a half just twice, both in their 15-6 loss to the Bears in which they scored 6 and 0 points. Correction: 38-11. Neglected the three halftime ties. Patriots 3, Rams 0 (0:00): The Rams could not capitalize on the turnover. Dont’a Hightower sacked Jared Goff for a 6-yard loss on the first play of the drive, then Goff found Brandin Cooks for 14 yards on 2nd and 16. Goff’s third down pass intended for Robert Woods fell incomplete. After a 58-yard John Hekker punt, Tom Brady kneeled to end the half. Patriots 3, Rams 0 (1:13): Tom Brady’s pass to a diving Rob Gronkowski on 4th and 1 was tipped away from the Patriots tight end. Los Angeles took over at their own 32-yard line. On the previous play, Rams cornerback Marcus Peters wrapped up Cordarrelle Patterson 1-yard shy of the first down marker on 3rd and 10. Bill Belichick elected to go for it but the Patriots could not convert and turned the ball over on downs. Julian Edelman took a Tom Brady pass 10 yards for a first down on the first play of the drive. The Patriots wideout moved the chains again two plays later, picking up nine yards on 2nd and 7. Patriots 3, Rams 0 (2:00): At the two-minute warning, New England stands on their own 49-yard line. Getting open vs. man and zone so far. Doing it all. Patriots 3, Rams 0 (3:57): Patriots linebacker Kyle Van Noy sacked Jared Goff for a 14-yard loss on 3rd and 2 to force another three-and-out. Todd Gurley picked up eight yards on back-to-back carries before Van Noy burst through the Rams’ offensive line. Punt No. 4 -- more punts for Hekker than he had in 14 of 18 games this year. Patriots 3, Rams 0 (6:14): Tom Brady found James White for five yards on 3rd and 7 as the Rams forced a three-and-out. Patriots linebacker Albert McClellan was whistled for holding on the 53-yard punt, giving Los Angeles the ball at their own 45-yard line. Rex Burkhead rushed for three yards on the first play of the drive, before Brady threw an incomplete pass intended for Sony Michel. 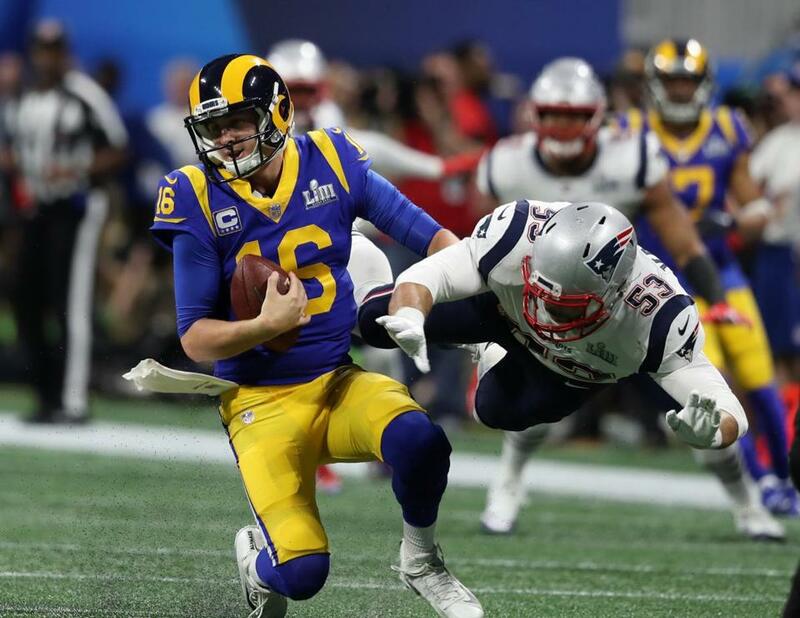 Patriots 3, Rams 0 (7:50): Jared Goff failed to connect on a 3rd and 10 deep ball from the New England 49-yard line. Julian Edelman returned John Hekker’s punt to the 17-yard line. Jared Goff found wide receiver Robert Woods on the second play of the drive. Woods tapped his toes in bounds for an 18-yard gain down the left sideline, then the Rams snapped the ball before Bill Belichick could challenge the close play. A 3-yard completion to Brandin Cooks and a 3-yard loss by C.J. Anderson led to Goff’s incompletion. Rob Gronkowski hauled in a pass during the first quarter. Patriots 3, Rams 0 (10:29): Stephen Gostkowski split the uprights from 42 yards to give the Patriots the lead. 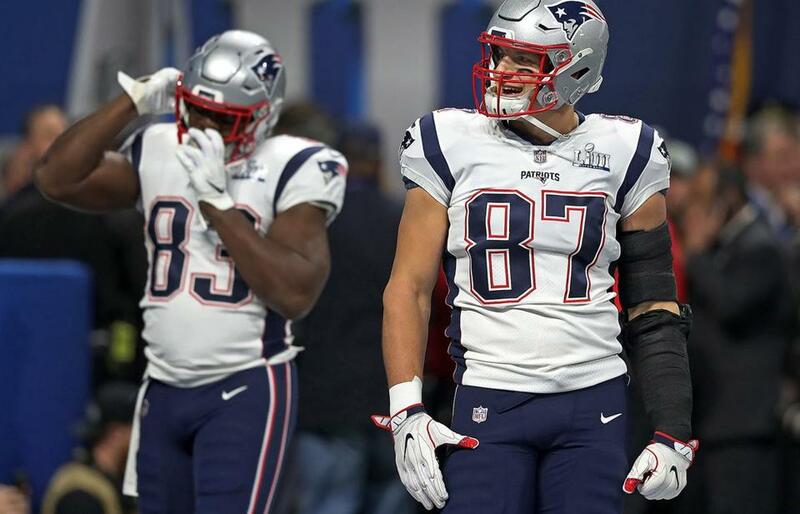 New England’s drive stalled when Cordarrelle Patterson took a jet sweep one yard, Tom Brady threw an incomplete pass, and Rob Gronkowski was upended short of the first down marker on 3rd and 9. On the third play of the drive, Julian Edelman found space in the Rams’ secondary, then Brady found him for 25 yards on 3rd and 1. Patriots 0, Rams 0 (14:11): Patriots defensive end John Simon knocked down Jared Goff’s pass to force a Rams’ three-and-out. The Patriots will start on their own 37-yard line after John Hekker’s punt. C.J. Anderson rushed for five yards on the first play of the drive, before a false start penalty wiped out that gain. Anderson picked up three yards on the next play, then Simon intervened on 3rd and 7. Hekker has punted three times. He punted two or fewer times in 9 of the Rams' 18 games this year. 8th time in 9 Super Bowl games that the Brady-led Patriots haven't scored in the first quarterl. This is the 5th time among those nine games that neither the Patriots nor their opponent have scored in the first quarter. There should be a premium required for the 0-0 square. Patriots 0, Rams 0 (0:12): Tom Brady’s throw intended for Julian Edelman on 3rd and 5 fell incomplete as the Patriots’ drive stalled at the Rams’ 40-yard line. Punter Ryan Allen pinned Los Angeles at their own 6-yard line. Early in the drive, Julian Edelman dove beyond the first down marker to move the chains. Two plays later, Brady rifled a pass down the sideline to Edelman for 25 yards. On the next play, Rams defensive end John Franklin-Myers sacked Tom Brady for a 9-yard loss. The Patriots quarterback fumbled the ball, but New England recovered. Patriots got a dose of their own medicine on that last Brady sack. They faked bringing a linebacker. That threw off Shaq Mason, who didn't block anyone when the LB dropped out. That gave Donald a 1-on-1 opportunity and he took advantage. Rob Gronkowski picked up 14 yards on 2nd and 19, before Brady’s incomplete pass brought out the punt unit. Patriots 0, Rams 0 (3:25): Patriots safety Patrick Chung broke up Jared Goff’s throw on 3rd and 3 to stall the Rams’ drive at the New England 42-yard line. Punter John Hekker sent the Patriots back to their own 19-yard line. On the second play of the drive, Jared Goff connected with Josh Reynolds for 10 yards and his first completion of the night. Defensive end Adrian Clayborn pressured Rams quarterback Jared Goff during the first quarter. Patriots 0, Rams 0 (5:35): Stephen Gostkowski’s 46-yard field goal attempt missed wide left. Sloppy start for the Patriots. Brady throws a pick in Rams territory on their first drive. They burn two timeouts in 82 seconds and miss a 46-yard FG on their second drive. Hard to tell which team has played in three straight Super Bowls. The Patriots’ 11 play, 60-yard drive stalled when running back James White was stopped short of the first down marker on 3rd and 8 from the Los Angeles 31-yard line. Three plays into the drive, Brady found Julian Edelman for an 11-yard gain on 3rd and 9. After Dante Fowler Jr. stuffed Sony Michel for a 4-yard loss, an unnecessary roughness penalty on Nickell Robey-Coleman moved the chains for the Patriots once more. On the first play following a Patriots timeout, Brady tossed it to Rob Gronkowski over the middle for a 19-yard gain. The Rams celebrated after intercepting Tom Brady’s first pass of the game. Patriots 0, Rams 0 (6:17): On the Los Angeles 31-yard line, the Patriots called their second timeout of the drive. Patriots 0, Rams 0 (11:15): The Rams went three-and-out on their first drive of the game. After a 2-yard rush by Todd Gurley and an incomplete pass, Jared Goff’s third-down throw intended for wide receiver Josh Reynolds fell incomplete. Tom Brady's only had one other opening-drive pick in a playoff game: 1/6/11 vs. Jets. This one his first on his opening pass. Patriots 0, Rams 0 (12:06): After Rams cornerback Nickell Robey-Coleman deflected Tom Brady’s pass intended for Chris Hogan, linebacker Cory Littleton caught the ball for an interception. Los Angeles took over at their own 27-yard line. Cordarrelle Patterson returned the opening kickoff 38 yards to the 39-yard line. Sony Michel took a handoff from Tom Brady 13 yards on the first play from scrimmage. After a 6-yard gain by Patterson, Michel picked up another first down with a 5-yard dart up the middle, before Littleton’s interception. Tom Brady's first pass of Super Bowl 53? Intercepted. Patriots captain Matthew Slater called heads, and it came up tails. The Rams deferred, and the Patriots will get the ball to open the game. Patriots: TE Stephen Anderson, OL James Ferentz, S Obi Melifonwu, DL Ufomba Kamalu, DL Keionta Davis, DE Derek Rivers, and DB Duke Dawson. Tight ends Dwayne Allen and Rob Gronkowski loosen up before the game. 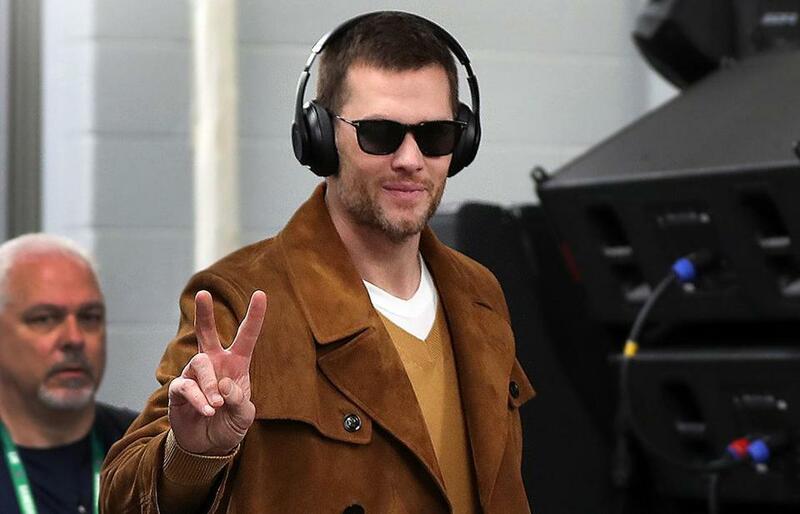 Brady to Jim Gray on @WestwoodOne pre-game interview: ?We came up short last year, and I think that stuck with me all year, and I know how badly I want this one ? I asked God this week, ?One more, and I?ll never ask for one more.?? Tom Brady and Julian Edelman are pictured before the game. 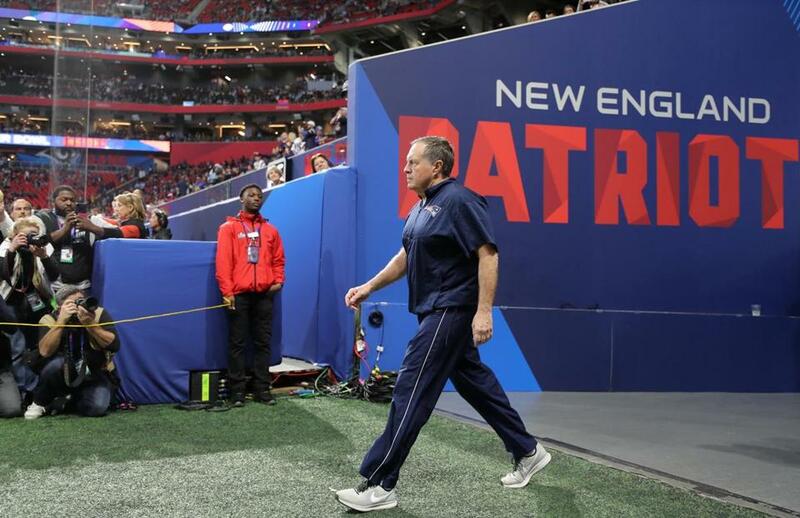 Bill Belichick took the field before the game. 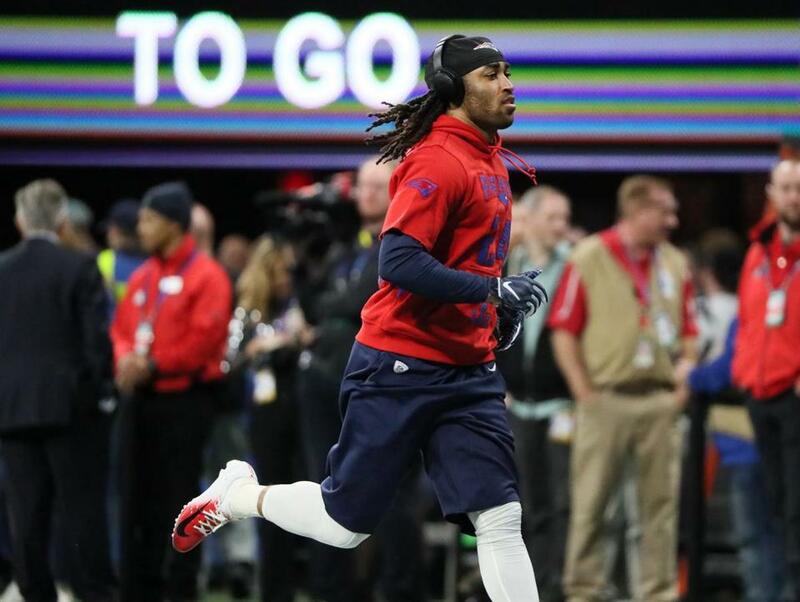 Cornerback Stephon Gilmore warmed up on the field before the game. 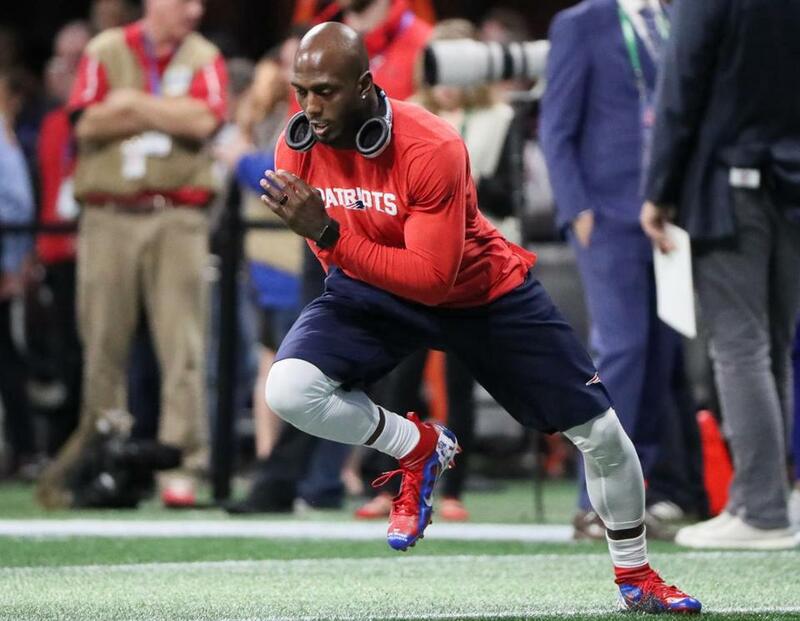 Patriots defensive back Devin McCourty warmed up before the game. A group of Patriots fans waited near the New England tunnel for the players to come out before the game. 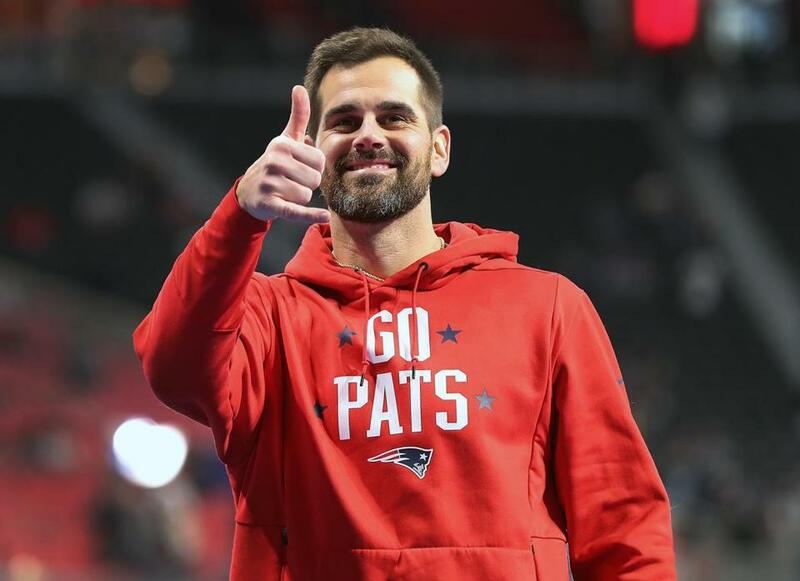 Kicker Stephen Gostkowski had a big smile and a thumbs up for someone in the stands as he walked off the field before the game. 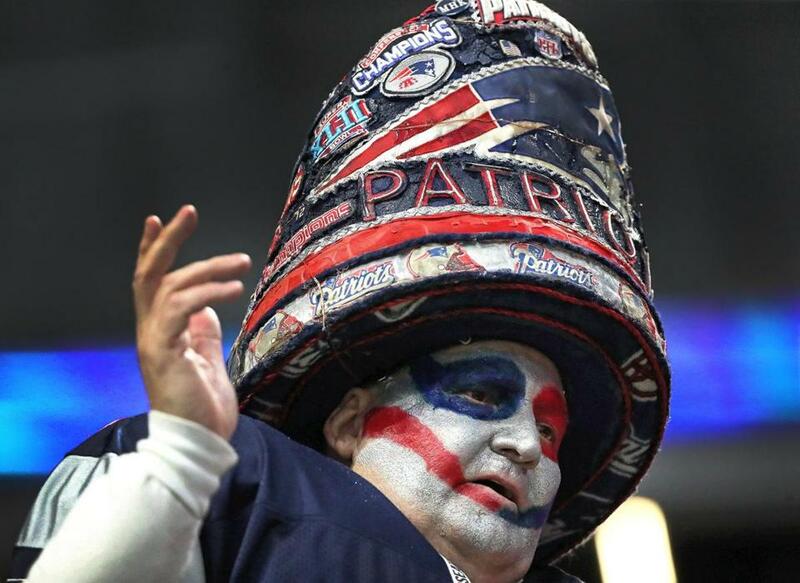 This Patriots fan arrived early for the game. Deatrich Wise is healthy and playing. Adrian Clayborn and Danny Shelton also active. Patriots fans arrived early at Mercedes-Benz Stadium. Tom Bradyarrived at the stadium. 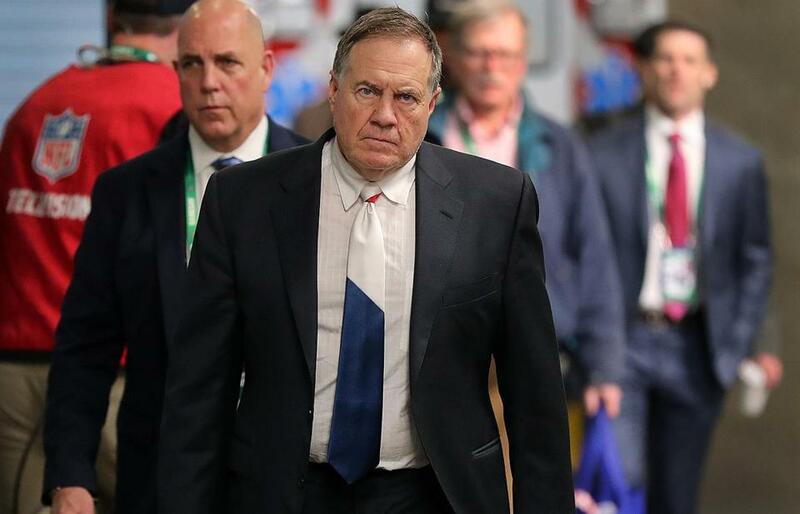 Patriots coach Bill Belichick had his game face on as he arrived at the stadium. ■ The roof of Mercedes-Benz Stadium in Atlanta will be closed, then opened, then closed again Sunday during the Super Bowl. Here’s the plan. 1. Los Angeles chargers: Creating pressure on Tom Brady up the middle without blitzing is a must. This falls on the broad shoulders of Aaron Donald and Ndamukong Suh. If Brady gets time, he’ll carve up any secondary. 2. Los Angeles traffic: Rerouting Julian Edelman and the other receivers will throw off the precision timing they have developed with Brady. Give them a clean break off the line and they’ll break your back. 3. Los Angeles kings: Get Jared Goff comfortable with some easy early throws. He can be erratic, but once he gets hot, he’ll sizzle. This also sets up the big play to Brandin Cooks later. 1. Wham: James Develin, Rob Gronkowski, and Dwayne Allen must come in motion and lay some wham blocks on Aaron Donald and Ndamukong Suh. It could buy Tom Brady an extra half-second, and that’s all he needs. 2. Bam: Take some deep shots to the speedy Phillip Dorsett. At best, it’s a big play. At worst, it forces the defense to respect it and will open up the underneath stuff for Julian Edelman and James White. 3. Thank you, Van: Kyle Van Noy has become a versatile and vital member of this defense. He needs another standout game where he disguises his duties and destroys ballcarriers. Continue reading Jim McBride’s comprehensive scouting report on BostonGlobe.com.